The heat of summer always make me think a little bit lighter when it comes to food. During the Texas heat wave between June and September, I tend to serve lot of sandwiches, light vegetable soups and salad...lots and lots of cool, crisp salad! 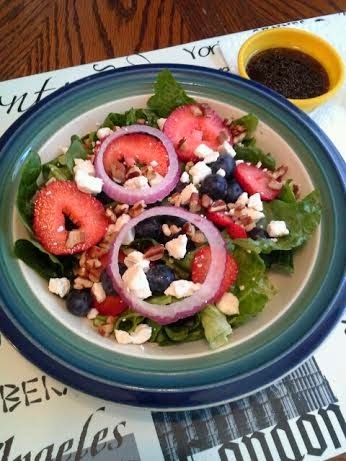 I like to get a little adventurous with my salad though and many of my favorites actually include fruit or whole, cooked beans and and some kind of wonderful, crumbly, sharp cheese. No one said salad had to be a plain, boring, one-slice-of-tomato-on-the-side garden side salad! I made this salad for my husband a few days ago, and when saw it all put together, he said "What a weird salad, but it looks pretty". True story. But, guess who ate the final serving from the big bowl? There will be lots of salad served-up here at my house over the next several weeks and as a result, (watch out readers, my food-geekiness is really showing here) this recipe marks the first of a short series of posts on salad! 1. Place all ingredients, in the order listed, in layers in a large bowl or individual serving bowls. 1. Combine all ingredients in a container with a lid and shake until well-mixed.